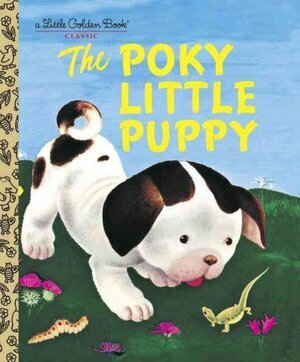 The Little Golden Book called The Poky Little Puppy, by Janette Sebring Lowrey and Gustaf Tenggren. Golden Books were a big part of my childhood. What about yours? My mother especially liked to read us The Poky Little Puppy, I guess because we were all inquisitive — and took too long with everything. Recently, NPR offered a trip down that memory lane. From Lynn Neary: “In the 1950s and ’60s, if there were any children’s books in a house, at least one of them was likely to be a Little Golden Book. … Those beloved books celebrate their 75th birthday this year. ” ‘Up until then, children’s books were found mostly in libraries or high-end book stores and were meant to be handled with care. They tended to be very expensive. So even if you could find one of these books in a store, only a certain percent of the population could afford to bring them home,’ explains author Leonard Marcus. “The books are now published by Penguin Random House.” More. I loved Golden Books. My father preferred to read us books he considered classics. He was certainly amusing when reading Rudyard Kipling’s Just So Stories. But my brother and I found Hans Christian Andersen stories creepy (the children of Dickens found Andersen himself creepy when he visited). The one upbeat tale in our Andersen collection — “The Tinder Box” — we insisted our father read over and over no matter how often he urged us to pick a different one. My mom was a first-grade teacher so we had lots of kids books around (Dr. Suess! ), and books like “Poems Teachers Ask For.” I loved the Grimms and H.C. Andersen and my favorite Golden Book was “Kerry, the Fire-Engine Dog,” probably for obvious reasons! First grade teachers should be honored as national treasures.